Rongtön Sheja Kunrig (Tib. རོང་སྟོན་ཤེས་བྱ་ཀུན་རིག་, Wyl. rong ston shes bya kun rig) aka Shakya Gyaltsen (Tib. ཤཱཀྱ་རྒྱལ་མཚན་, Wyl. 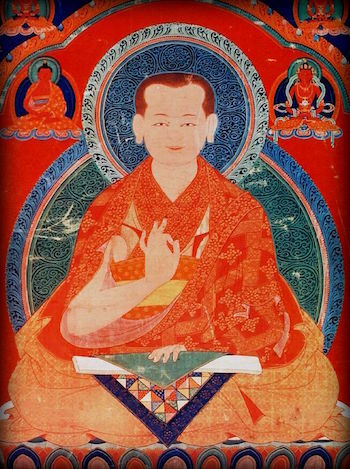 shAkya rgyal mtshan) (1367-1449) — one of the greatest scholars of the Sakya school, and indeed in all Tibetan history, who, like his principal teacher Yaktön Sangye Pal, is especially renowned for his mastery of the prajnaparamita teachings and the text of the Abhisamayalankara. He taught at the great Sangphu Neuthog, and founded his own monastery of Nalendra in 1436. His most famous disciples were Shakya Chokden and Gorampa Sönam Senge. Cabezón, José Ignacio. 'Rong ston Shākya rgyal mtshan on Mādhyamika Thesislessness' in Tibetan Studies, vol. 1, Wien: Verlag der Osterrichischen Akademie der Wissenschaften, 1997, pp. 97-105.